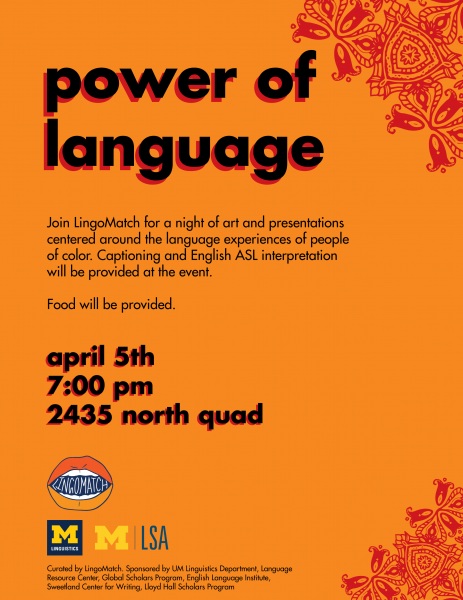 Join LingoMatch for a night of art and presentations centered around the language experiences of people of color (POC). The event delves into how language barriers create challenges in POC communities and how these challenges are perceived, understood and interacted with by different language communities. We will display art created by local and student artists of color. In addition to discussing language barriers, the event will give artists an opportunity to discuss how language enriches their life, informs their artwork, as well as how it challenges the individual and community, especially regarding identity, bias, and prejudice. Captioning and English ASL interpretation will be provided at the event. Food will be provided!